87 Interactive is a Full Service Internet Marketing Agency that helps companies realize their online potential, extend brand awareness and drive sales through effective search marketing strategies. We specialize in Organic Search Engine Optimization (SEO), Web Analytics Consulting, Search-Engine-Friendly Web Design, Blog and Social Media Marketing. So what is organic search marketing in essence? Why is it so important to be in the top ten "organic" results? Let's say you are a law firm looking to grow your business online. When people search in Google, Yahoo or MSN using one of your keywords i.e. 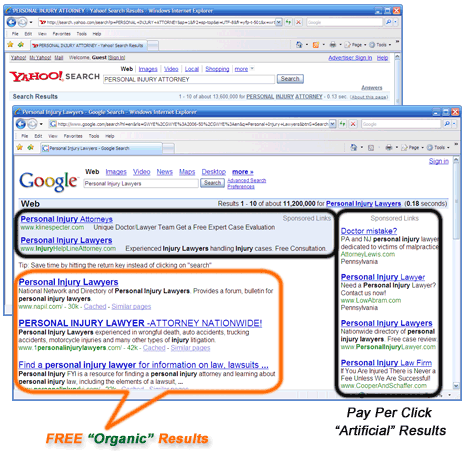 "personal injury lawyer," they will see two types of listings: Sponsored (Pay Per Click) and Natural (Organic). Pay Per Click ads will appear next to the Natural "organic" search results, either way, you are advertising to an audience that's already interested in you. Great, but what does that mean to your business?! What is the difference between these two search marketing approaches? Pay Per Click is a quick and dirty way to get immediate but limited traffic results. It’s like bribing your way to the front of the line only to find out that you have to pay even more to stay there. Alexander Pope said it best: "A small discredit of a bribe - scarce hurts the lawyer, but undoes the scribe!" Marketing research studies have shown that sponsored Listings get less traffic, lower click-through and conversion rates then organic Listings. Moreover, the cost of sponsored ads is growing exponentially, as the market gets more saturated with competitors eager to take your place. Search engines use a natural selection process when deciding which of the millions of websites belong in the top 10. Only the most relevant, high quality sites make the final cut. This has a profound effect on consumer behavior. Users prefer organic listings to paid ads because of the underlying trust factor. Even though getting high rankings for popular keywords takes time, dedication and commitment to excellence; it is justly rewarded with quality traffic and a higher ROI. Organic search engine marketing is a winning cost effective strategy for the smarter business. Natural Listing Get More traffic then Paid Sponsored Listings. Eyetools, Enquiro, and Did-it uncovered that being number 6 in the Google organic search results will bring you the same number of clicks as being in first position in the paid search results, and far more than from the second, third and lower sponsored listings. Organic Search Visitors Convert Nearly 30% Higher Than Paid Search visitors. Users tend trust organic search engine results to be more relevant to the information they are seeking, and rightfully so. Statistics show that searchers are more likely to click on a natural SEO result vs. paid sponsored link. Today’s online businesses are more ROI accountable. One cost-effective way to boost ROI is through organic search-engine optimization. Jupiter Research study found that companies who run both SEO and PPC campaigns show a significantly higher ROI with natural search engine optimization. Rent vs. Own website traffic. Investing in quality content and search-engine-friendly architecture is like investing in your own home. This investment can generate free traffic for life, while paying search engines and advertising networks per click (PPC) is like paying rent, it will eventually break your bank. Organic Search Engine Listings are not susceptible to click fraud. PayPerClick listings are highly susceptible to click fraud which could be a real threat to your business. However organic listings are risk free. At 87Interactive we fully comply with and support the SEO code of ethics. With search engines constantly raising the bar for top 10 placements and the marketplace becoming increasingly crowded, it’s essential that companies stay one step ahead of the curve and engage in active pursuit of ethical search engine optimization services. 87 Interactive is an Ethical SEO company that is among the few in the industry readily equipped to fight the ever-increasing and highly disruptive problem of Search Engine Optimization Malpractice. Our exclusive SEO Rehab™ package helps companies into a quick recovery of search engine rankings, assets and goodwill. Each client has unique marketing objectives and challenges and requires personalized attention in order to realize the most benefit out of their natural search engine marketing campaign. We believe that there is no quick fix, no one-size-fits-all answer, but there are some valid, tested, time-honored strategies. Those strategies are based on holistic optimization principles, adherence to the SEO code of ethics, and our client-centric approach along with long standing commitment to quality. If you really want your website to rank well, build a good website that people find useful and want to come back to, study branding and how that can help you, and of course, like everything else in a competitive environment, promote and market it effectively and wisely. Take your time to review all the useful information on this site and contact us with questions or comments about any of the services we offer. 87Interactive will gladly provide you with a FREE, No Obligation initial assessment of your website and offer a variety of flexible programs to address the issues that are important to you and your business. By arming you with the right strategy and tools to improve results, 87Ineractive can help you reach the next level of search engine marketing. Copyright © 1997 - 2016 87 Interactive All rights reserved.